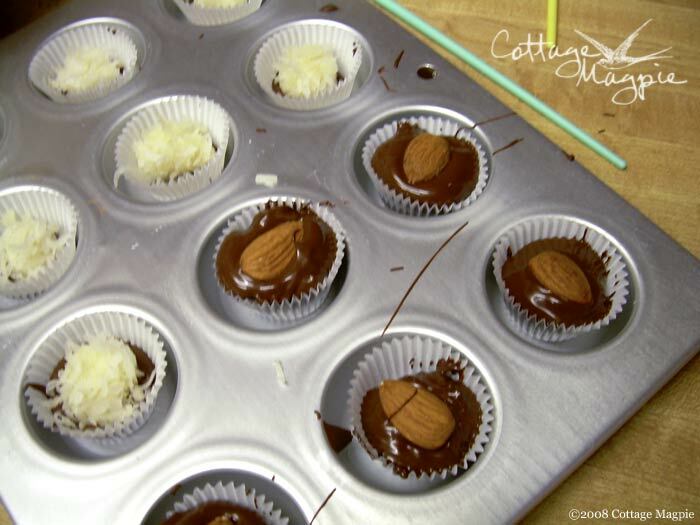 Candy molding or melting chocolate is chocolate that is prepared to work will for making molded chocolates. It melts easily and hardens quickly and doesn't require tempering. It is available by the bag at most craft or specialty baking stores. It is also possible to make your own chocolate. 1. In a small, microwave-safe dish, heat the brown rice or corn syrup until warm and runny. 2. Add the syrup to the coconut and work the syrup through the coconut with a spoon. It will not seem like enough syrup, but eventually you can work the syrup throughout the coconut. Set aside. 3. Set out a dozen paper mini-cups onto a small tray. I like to use a mini-muffin pan to keep them steady, but this is optional. Any tray will do. You just want to be able to put them in the fridge afterwards with minimal sliding and squashing. 4. Put a cup or so of candy melting chocolate in a small microwave-safe dish and melt, on low power, in 30 second intervals. Try to stir after each run, because often th chocolate will look solid when it's actually melted. 5. 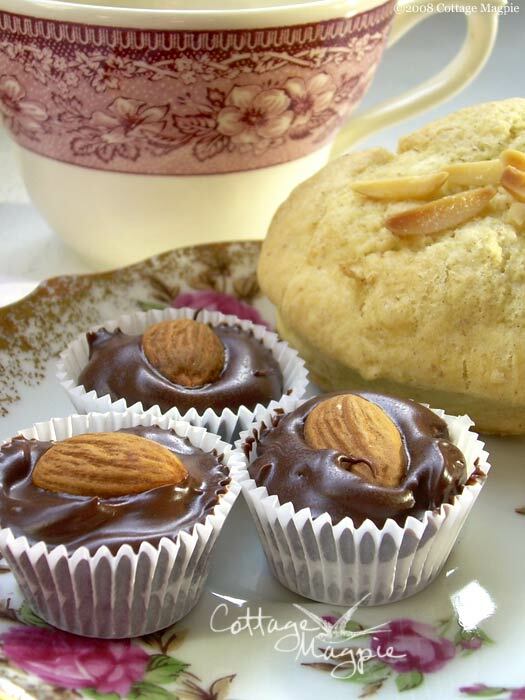 Using a small spoon and the chocolate brush, put a small amount of chocolate into the bottom of each paper cup, just enough to cover the bottom. Use the brush to control and spread the chocolate. Cover the bottom and paint it halfway up the sides of each cup. 6. Next, take two or three pinches of the almond & syrup mixture and smash it between your fingers to create small, flat balls. Set one into each cup, pressing slightly into the chocolate. 7. Using the same spoon and brush technique, finish the candies one at a time. 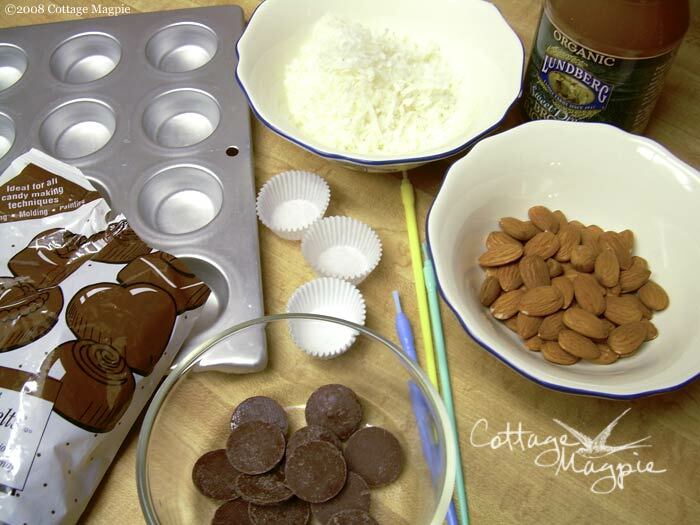 Cover each almond ball with more chocolate, using the brush to gently push chocolate down the sides, then press a whole almond into the top. You may have to melt or re-melt more chocolate to finish. 8. Place the tray of candies in the refrigerator until set, about 10-15 minutes. That's it! To eat, simply peel back the paper cup and enjoy. Or, share with a friend for a special Valentine's Day treat.